How about a "curse" of magpies? I used to think they wonderful, gorgeous birds ... until they took up the habit of "singing" underneath my bedroom window at 5 o'clock each morning. "a congress of baboons" is very fitting. 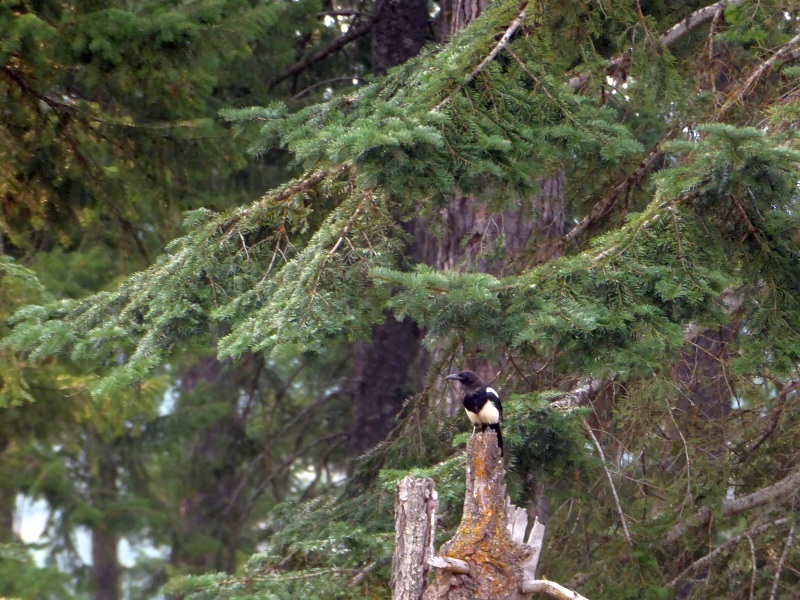 As noisy as magpie's are, they are much quieter than they were years ago. My theory is that the nosiest one met an untimely death, and that led to much quieter quarrels now-a-days. I live in a small city surrounded by a large city, and we have a flock that makes the rounds every day. Very seldom do we even hear them. They have gotten very adept at breaking open walnuts. We have a tree that makes small nuts, so they aren't cleaned up as well as they should be. The magpies will pick up a nut and drop it on a rock, over and over, until it cracks open. They then pick out the meat. I have to use a hammer to crack them open, but the magpies have the patience to keep at it until they finally get them open. Magpies are a pain in the backside. I have watched them follow me, when out in the field planting corn, to be digging up faster than I can plant. Can not think of any other bird that I dispatch any faster. Am aware the Man upstairs put everything on earth for a reason, bit have not figured the reason for magpies. I am sure someone will explain the facts to me. Have a great week in north Idaho, stay cool. We are to see temps above 100 again this week and next. 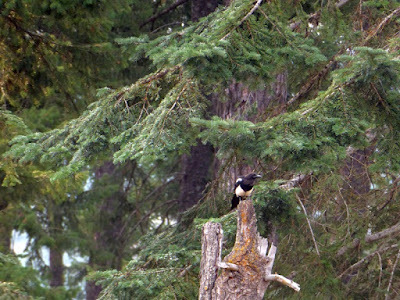 Our magpies look so much different than yours. Ours have a large amount of yellow on them. In the spring there were an abundance of them but come summer they disappeared. It has been extremely hot this year so maybe that is why. I didn't know they would steal my chicken eggs! 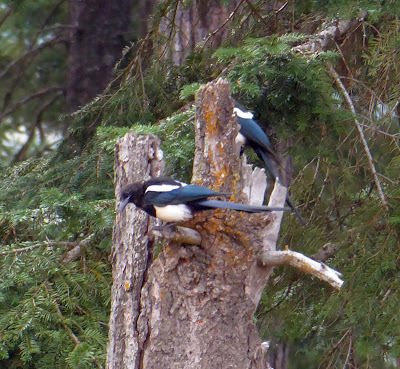 We had a family of magpies move into the huge blue spruce tree across the road. Normally that tree was occupied quite thickly with sparrows. Well the sparrows moved out when their bully neighbors moved in. Apparently at one point a cat caught one or more of their chicks. The magpies, being bird brains, couldn't tell WHICH cat was the culprit so went on a vendetta against ALL cats. It was silly to watch the neighborhood cats slinking close to the buildings and fences and scurrying across the streets and the magpies (dozens of them) would swoop down on them, pecking and flapping their faces. 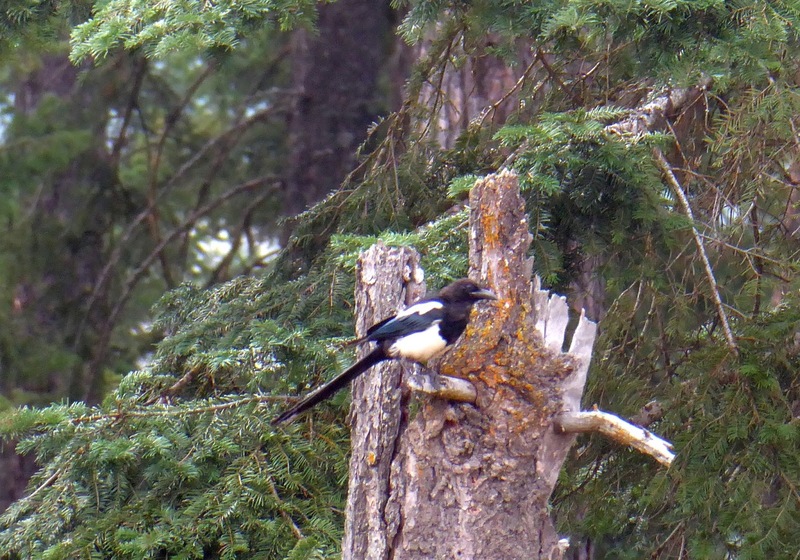 One day I heard a terrible pitiful moaning and saw a magpie down on the driveway across the road. It was flopping and dragging itself around in circles while giving out this wounded distress cry. Then I saw my big sturdy Tom cat, in stealth mode, sneaking through the grass toward it. Carefully, in short smooth bursts, low to the ground, he crept up on his quarry like a lion on the Serengeti plain. But I saw what he didn't. On the house roof, in the tree, on the cable wires high above him, a good dozen magpies watching quietly,impatiently shifting from foot to foot. Finally the Tomcat sprang his trap and leaped (impressively) on the wounded quarry. Only it wasn't wounded! It and all the birds sprang into the air with a raucous cry, and all swooped down on the hapless cat. An epic battle ensued. A lesser cat might have fared worse. Feathers and fur and loud cursing from both species tumbled up, down, and back up that driveway. Dogs howled. Neighbors came out to look. Cats dove under cover. All other birds fled. Finally the Tomcat cut and ran for our garage, but victorious, with a magpie clutched in his jaws. I assume he ate it. I found a ton of feathers but no carcass. The magpies moved out and haven't been back. 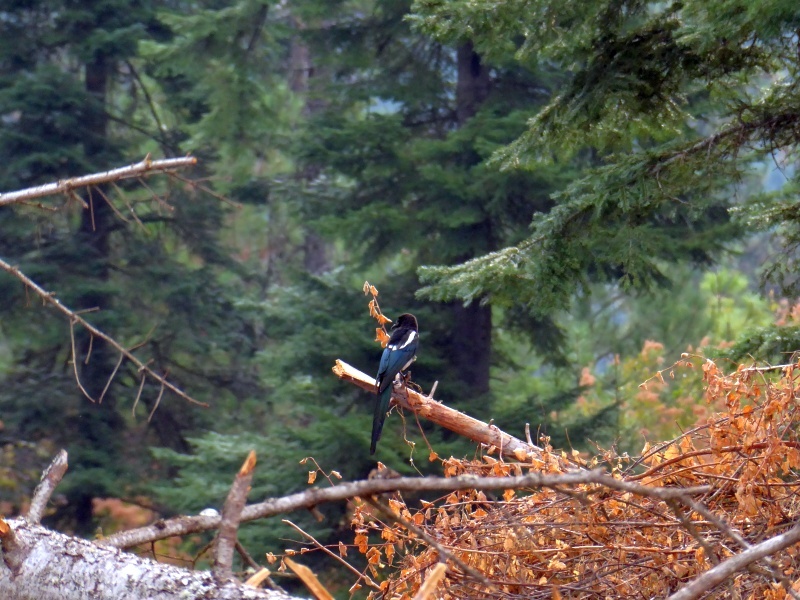 Last week, we had a large number of birds roosting in our old dead tree. They were creating a terrible amount of noise and I wondered what kind of bird they were. They were there and then gone in just a matter of a few hours. 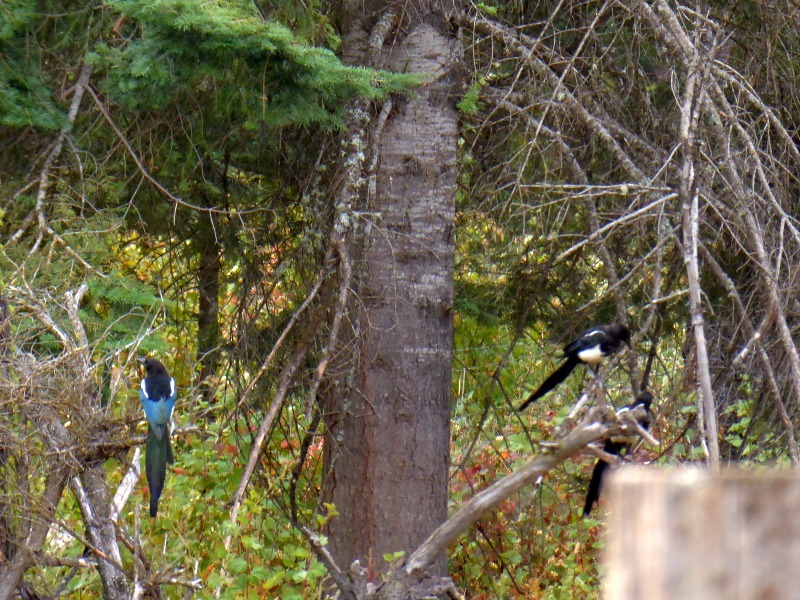 They were magpies! They sounded just like one of the youtube videos. Now I know. Thanks. If you want to discourage them, you could consider rock salt shotgun shells as a non-lethal alternative to bird shot. Birds. 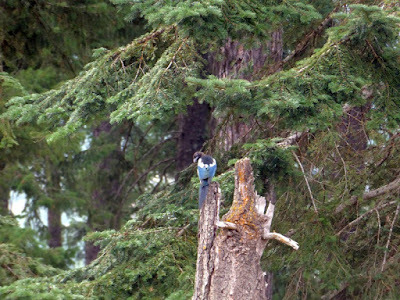 Few stop to consider that the beautiful "song" of a bird is really either a mating call or a territorial warning. So all that chirping and trilling you hear in the morning? It's either, "Hey, baby! Come on over to my place!" or "Get outta here! This is mine!"